But if you must use PayPal…see below! Buy Signed Copy New Edition! The most prescient Economic Thriller of our generation! An incredible story of power, romance, revenge and international finance spanning three centuries. The issues could not be more timely! 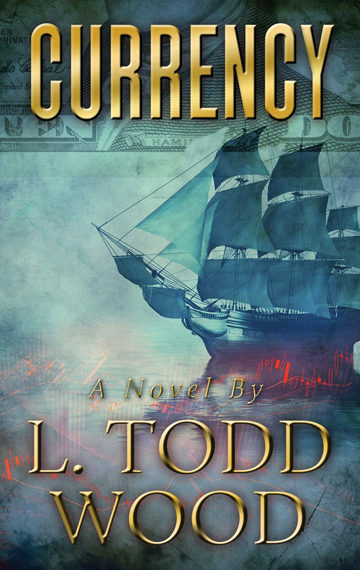 Todd Wood’s economic thriller, “Currency,” spans three centuries and includes tales of pirates and America’s early leaders. “Currency” kept me curious until the very end. A unique page-turner. —Bill Gertz, senior editor, The Washington Free Beacon. In Currency, Wood has pulled off a first novel that captures the reader with a page-turning adventure, while it addresses head-on the most pressing and intense global economic, military and political issues of our very challenging current times. Wood’s real world experience on both Wall Street and at the center of the US Military Special Operations world, combine with his love of history and command of current global issues, to create a story that is as intense and gripping as it is timely. Currency weaves the historical adventures of our US Founding Fathers who built the country’s early economic structure, with current day hero Connor Murray. Connor unexpectedly finds himself thrust into a world shaped as much by greed, betrayal and violence as it by heroism, loyalty, love and the quest for personal peace. Fate forces Murray to navigate events that play out on the world stage. The United States’ current economic weakness collides with its international rival’s very real drive for economic, political and military influence. This collision produces an intense drama and adventure that is as scary as it is possible amidst the world’s current state of affairs and balance of power. If you love a good adventure story on both the personal and international level – Currency is a must read. If you’re concerned about how the United State’s current economic challenges could play out for the country in a very real way – Currency is a must read. And if you want to be an early reader of a new author who has tremendous promise – Currency is definitely a must read.